Nowadays E.M. Forster is best known as the source material for Merchant Ivory films such as Howard’s End and A Room with A View. That’s a shame, as it both underplays the central theme of his work – the contrast/disconnect between culture and business as well as ignoring his other work. I’m thinking particularly of the science fiction short story The Machine Stops, which describes a future world where humans live underground in cells, communicating only through an apparatus called The Machine. No-one travels if they can avoid it and all their bodily and spiritual needs are met by The Machine. Ringing any bells? 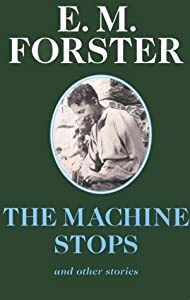 The most impressive point for me is that Forster wrote it over a century ago, before the advent of computers and while telecoms was in its infancy. I was reminded of the story when hearing futurologist Graham Whitehead speak this week. He predicts that we’re only at the start of the technology journey and that the pace of change will only accelerate. I tend to agree but as someone involved in communications think we need to make sure we’re not just chasing the next big thing, but make sure we’re keeping a balance with existing communication channels, whether radio or even, dare I say, face to face, physical meetings. Otherwise, as in the story, what will we do if and when The Machine Stops?